In today’s world looking young and fit portrays an image of confidence that can benefit you both personally and professionally. It all begins with a good attitude on the inside, and healthy skin and a slender appearance on the outside. At Chic La Vie Medical Spa we provide anti-aging solutions, fat reduction, skin tightening and rejuvenation procedures that will enhance you. Chic La Vie was founded by top board certified plastic surgeon Lane Smith, MD along with his experienced staff, using the most advanced techniques to help you realize your goals. Our prices vary on your condition and treatment plan, so please schedule a consultation. We also invite you to join our new 365 Skin Membership or check out our monthly specials and promotional pricing. Chic La Vie™ Medical Spa of Las Vegas offers several life-changing medical spa procedures that will help create a younger-looking healthy you. To learn more about the medical spa procedures offered by Chic La Vie™, please click on one of the links below. Cellfina™: Unlike CynoSure’s Cellulaze, Cellfina™ is the only FDA-cleared procedure clinically proven to treat cellulite with results that last at least two years. Laser Hair Removal: Remove unwanted hair from your body with Candela Gentle Max Pro, the “gold standard” in laser hair reduction. CoolSculpting®: This new, revolutionary technology uses no needles or sharp instruments to reduce areas of fat to create a natural looking and smooth appearance. Acne Treatments: We offer many different skin treatments in our world class med spa. So we suggest you schedule a consultation to prescribe the proper treatment. Photo-facials: Reduce or eliminate signs of aging in the form of vascular and pigmented lesions, leaving the skin more even toned and textured with a more youthful, radiant appearance. Laser Genesis: Now you can have a more youthful appearance by treating those conditions that are typically associated with premature signs of aging and sun damage, such as excessive redness, large pores, uneven texture, and fine-line wrinkles. Dual Fraxel Laser®: The Dual Fraxel Laser® is the perfect solution for people who want their skin to look younger, but don’t want to look plastic or fake and can’t afford a lot of time away from work or their social life. Dermaplaning: If you are a patient with rough, dry skin, excess vellus hair, mild acne scarring or fine lines and wrinkles you may be a good candidate. The results can leave your skin glowing! Venus Freeze®: By stimulating the production of collagen and elastin fibers. it causes the skin to contract and produce tighter skin, reduce fat and cellulite, and soften wrinkles. PRP FaceLift: Restore your skin’s healthy glow using your own blood platelets. Many patients call this a Vampire Facelift®, however the procedure is called Platelet-rich Plasma Facelift. Hair Restoration: Reverse the effects of aging with NeoGraft, a minimally-invasive hair transplantation method offering quick results and no incision marks. Laser Vein Removal: The Cutera Excel V helps to target the patient’s condition as well so for example a short pulse works well for superficial blemishes, such as small lesions and skin discoloration. Ulthera Skin Tightening: Ultherapy is the only FDA-approved, non-invasive facial procedure proven to reduce fat, lift and tighten skin on the neck, face and brow area. HydraFacial®: The invigorating treatments used in this procedure can help reduce fine lines and wrinkles, in addition to improving your skin’s texture, vibrancy, elasticity and firmness. Vi Peel Chemical Peels: Improve the tone, texture, and clarity of the skin with the ViPeel chemical peel procedure. Facial Filler Injectables: Reduce facial wrinkles and improve tissue volume with Botox® and dermal filler injectables. For lip injections, we prescribe Juvederm’s various syringes to attain fuller, plumper lips. Skin Treatments: Treat acne scars, stretchmarks, enlarged pore, and more with MedSpa’s variety of skin treatments. Body Contouring: Get the body you’ve dreamed about with Venus Freeze and Cool Sculpting, two non-invasive body sculpting alternatives. Skinceuticals: Daily homecare at its finest, Skinceuticals provides advanced skincare backed by science to correct the signs of aging, protect healthy skin, and prevent future damage. Dr. Lane Smith and his highly trained staff are dedicated to providing the most cutting edge cosmetically enhancing treatments for face and body. We pride ourselves on education, safe and effective treatments and outstanding patient care. We offer treatments in a state of the art Medical and Surgical facility. We encourage you to tour our spa and consult with one of our technicians today! 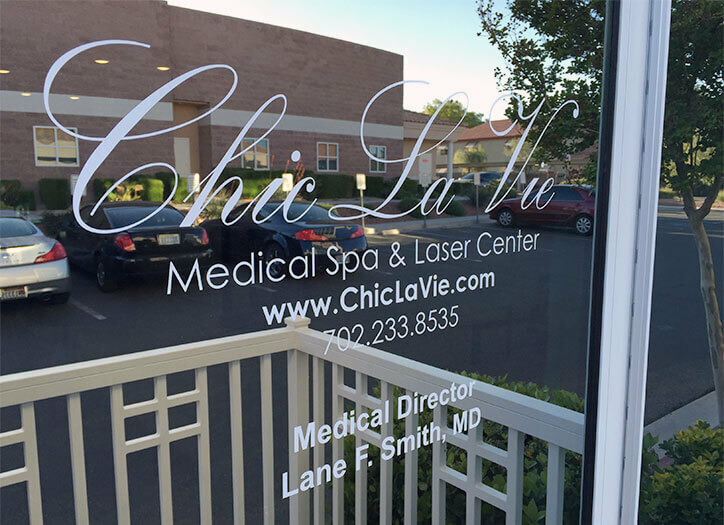 Chic la Vie Medical Spa and Laser Center is attached to the Smith Plastic Surgery medical facility which is owned and operated by renowned Plastic Surgeon, Dr. Lane Smith.